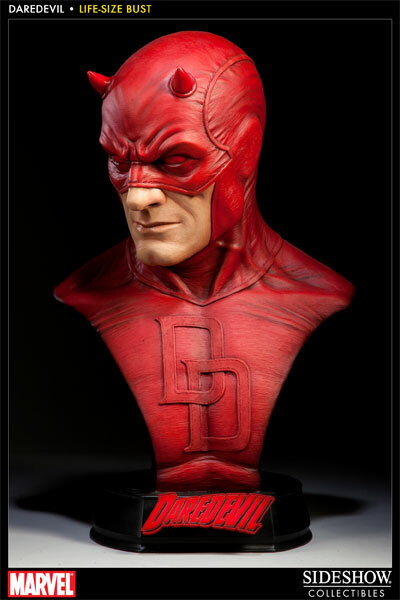 Order the Marvel Collectibles Daredevil Life-Size Bust today! Matt Murdock is Daredevil, the Man Without Fear. Daredevil first appeared in Daredevil #1 (1964) from Marvel Comics. In that issue, young Matt saves a man from an oncoming chemical truck, only to be doused by the chemicals himself. This accident blinds him, but also increases the power of his other senses, as well as a “sonar” sense from which he can acquire a sort of vision for his surroundings. Growing up to become a lawyer, Matt uses his skills to seek out injustice by day, and by night, he fights for justice on the rooftops of Hell’s Kitchen, New York — as Daredevil. This lifesize bust of Daredevil is created by Mike Najera (Paint), Armen Balyan (Sculpt) and David Igo (Design) for Sideshow Collectibles. It is 23″ high and weighs 20 lbs. Swing over to Amazon to order the Marvel Collectibles Daredevil Life-Size Bust!